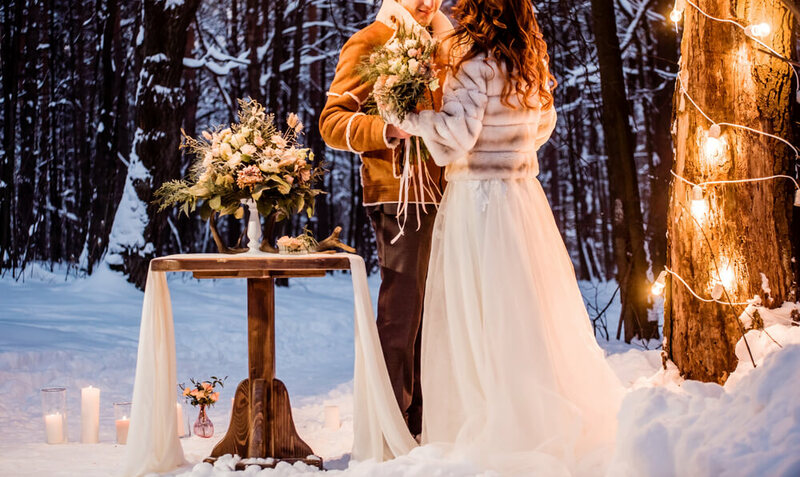 Great Tips for Your Winter Wedding | "DiBurros"
Don’t hesitate to plan your wedding for the wintertime! It might be an unpopular opinion, but winter weddings can be utterly magical and romantic. Sure, there are some minor issues that are inevitable with weddings held during the darker months. They are absolutely avoidable if you prepare everything beforehand. Dig into our simple tips and tricks to ensure your winter wedding goes off without a hitch! Make sure to stay warm on your wedding day. Add a chic faux fur stole or cape to match your dress, or as an alternative, look into long-sleeve wedding dresses. If the dress is long enough, you can always wear thick tights or leggings underneath. Boots can be a fashionable and practical choice, especially if New England’s weather surprises you with a sudden rain or a snowstorm on your special day. For grooms and groomsmen, warm and trendy velvet blazers would be a stylish and optimal addition. Would be a great idea to prepare cover-ups for bridesmaids as well. Check your venue’s decorations, make sure everything is set up in your favorite way. Pick rich and warm tones, and keep your chosen theme consistent with all arrangements, the cake and wedding favors for your guests. Candlelight will contribute to the romantic atmosphere, especially considering it’s going to get dark early. Talk to your photographer beforehand to brainstorm or discuss ideas you might have. If you want your pictures taken in natural light, plan a shoot before the ceremony starts. The traffic can always get worse with the weather, make sure to give extra time for travel to your wedding hall. Ideally, plan your ceremony and reception at the same venue to avoid transportation issues in event of bad weather. Take care of the coat check for your guests’ convenience, and offer them a hot drink upon arrival. DiBurro’s Function Facility will be more than happy to share the memories from this special day with you. We can guarantee you the top-notch service and organization throughout each step of your wedding preparations. Contact today for personalized assistance or call us now at 978-372-0441!